Save time and be more productive. 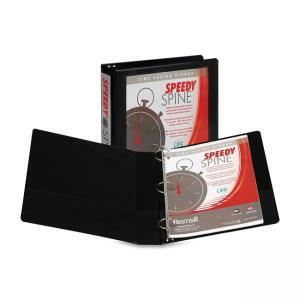 Speedy Spine binders feature a Patent Pending channel construction that allows for easy drop-in of spine inserts for custom graphics in seconds. The dilemma of tight, almost impossible to insert spine graphics has plagued view binders since the inception into the office products industry. Now Speedy Spine solves that time wasting problem by loading spine inserts 5 times faster than a traditional view binder. No more wiggling, fighting or sweating to customize presentation binders. Locking round ring keeps documents secure. Rings mounted on back lid allow pages to lie flat and adds a sleek, clear appearance with rivetless spine. Clear overlay on covers and spine for customization. Two inside pockets provide extra storage for loose documents. Holds sheet size 8.5x11. Contains 45% post-consumer recycled content. A Binders for Life product - Lifetime Guarantee.